OK, we get that you want to be the one guy in the universe to know precisely when housing prices have reached bottom before you buy. Well, the logic of multi-millionaire hedge fund manager John Paulson may just shut you up. He says that today's record-low interest rates make this the best time to buy homes in 50 years. 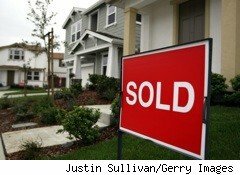 In fact, his advice is: "If you don't own a home, buy one," Paulson said. "If you own one home, buy another one, and if you own two homes, buy a third and lend your relatives the money to buy a home. "Does it matter what Paulson thinks? Well, he was in that small club of people who predicted the sub-prime collapse (a club that apparently no one in our government joined). But even more important, the math is in his court. The key to why this is a good time to buy a home is the historically low interest rates, which began to ever-so-slightly creep up this week. Calculators ready? Keller Williams provided this example on its blog. Let's say there is a house for sale for $250,000. Interest rates are 4.3%, which make your monthly principal and interest payment $981. Over the course of this loan, you will pay $191,693 in interest. Now let's drop the home price to $225,000 -- a 10% price deduction. If interest rates are a point higher -- 5.23% -- your monthly principal and interest are now $991 ($10 a month more) but your total interest paid over the course of the loan is now $221,282 -- about $30,000 more over the course of your loan. A 1% increase in mortgage rates more than offsets a 10% drop in the home's price. The key to home ownership has always been interest rates. And right now, they are at historic lows with some indications that they are beginning to creep up. So maybe -- just maybe -- real estate agents aren't blowing hot air when they say now is a good time buy or move up. And if the home prices go down some more, it really doesn't matter.